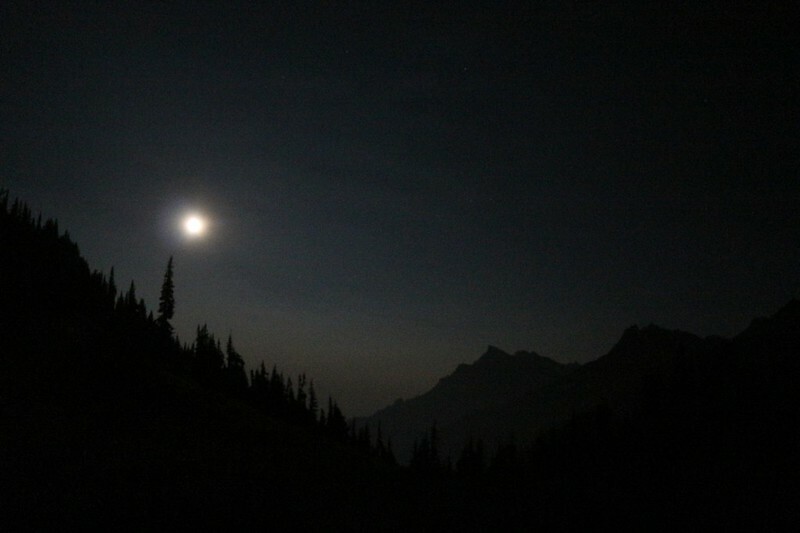 We woke up in the dark, at 4:30am, intending to start hiking before dawn. We had a lot of climbing to do that day, and we knew that it was supposed to be hot. 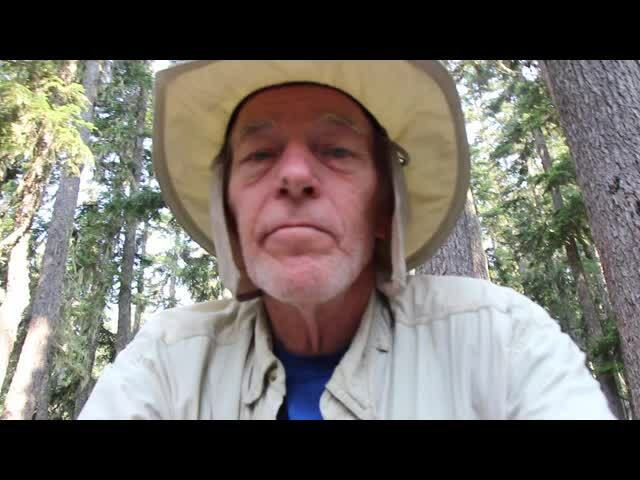 In fact, the entire northwest had been baking in a heatwave for the last month, and it wasn’t predicted to end for another couple of days, when a storm was due to arrive. We weren’t exactly thrilled about getting rained on, either, but wet weather is to be expected in the Cascades, even in August. Until the rain, however, we had no choice but to deal with the heat and haze. And dealing with the annoying Deer Flies, as well. Washington State wasn’t exactly being nice to us so far, but we weren’t going to quit the hike if we could help it. We got dressed, ate breakfast, and packed everything as the light gradually grew in the east. We left camp about 6am, just as the sun was rising, its rays touching the high points on either side of the valley. We figured that we had a couple of hours before the sun would begin roasting us, and we made the best of them. 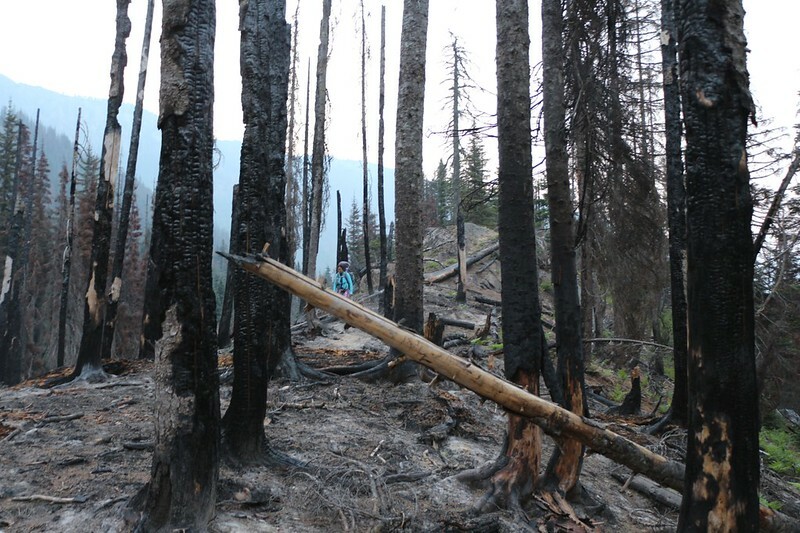 Initially, the trail climbed steeply uphill though a series of switchbacks as it left the burned zone behind. It was nice to smell the pine trees as we hiked through the verdant green forest. We discovered a pleasant campsite at the top of the switchbacks and took a short break. In a way, we wished that we had camped there last night rather than in the middle of all that devastation, but it was too late now. After Vicki’s nap, she felt recharged and we continued on. The trail generally followed alongside Buck Creek, but stayed high above the channel, so that we could hear it but never see it. We were glad we’d filtered plenty of water yesterday. 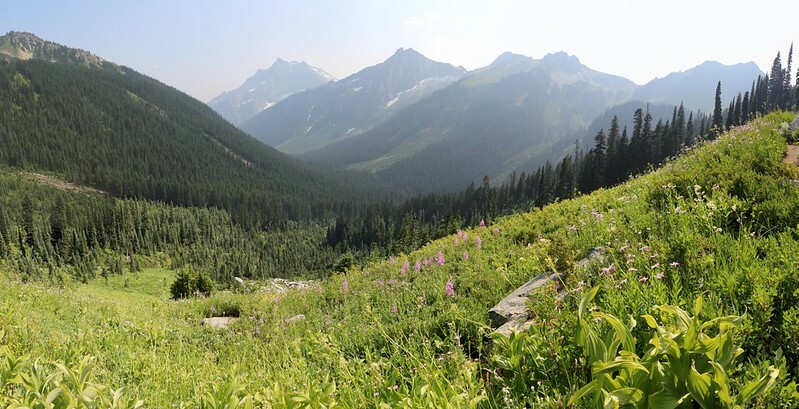 It was great being out of the charred sections, and we were able to enjoy the pines and wildflowers that the Cascades are famous for. 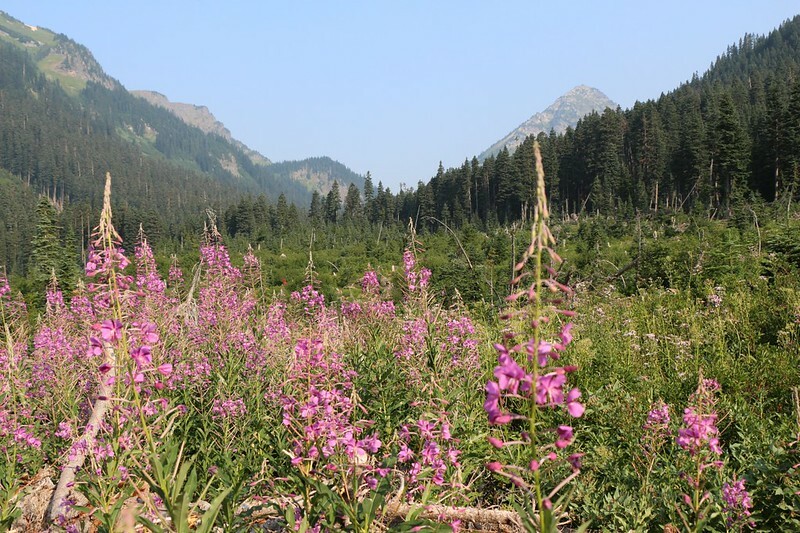 Fireweed with Buck Creek Pass and Helmet Butte in the distance. The pass only looks close. But all good things are tempered by their counterpart, it seems. The heat grew intense as we sweated and climbed. And the Deer Flies were back with a vengeance by 8am. Once again, Vicki was forced to wear a long sleeve shirt and heat-capturing long pants to prevent being bitten by the nasty creatures. If it wasn’t for the water squirter she never would have made it up that trail at all. We would have had to hike at night. And so we soldiered on. Eventually the trail left the valley bottom entirely and made a long switchback up the side. We gained a lot of elevation but had to sweat for it. When noon arrived Vicki was hot and exhausted. She was a walking zombie, and needed her usual remedy: A nap. But the trail was traversing a steep hillside and there were no convenient campsites to be found. So we kept hiking. Eventually, I noticed a short section of trail that was wider than usual, thanks to a large pine that was providing some extra support to the dirt on the trail. It also made some nice shade. It would be a great spot for a nap if it wasn’t for the annoying Deer Flies. Sleeping with bugs landing on (and biting) your face is not really possible. And then I had a great idea: The spot also looked wide enough to set up the tent! Or at least the inner bug-screened section with the poles. Unfortunately, the tent would also take up the entire width of the trail. We looked at each other, weighing the serenity of a bug-free environment versus the minor inconvenience of one or two hypothetical hikers. We’d only met three groups the entire day yesterday, and it was quite likely that nobody would pass us during lunch today. We decided to take that chance. Video of super-annoying Deer Flies buzzing around my face. DEET merely slowed them down; it didn’t stop them. It turned out to be one of the better decisions we made that day. We opened our packs, got out the tent, unrolled it, and attached the poles. We positioned it so that one side was almost falling off the edge of the hill while the other side left just enough trail to walk by if you had to. Then we grabbed our lunch, our books, some water, and a couple of pads to sit on and went inside the tent. In the short time that the door was open at least ten flies came inside along with us, so we spent the next few minutes hunting them down and killing them. After that, we looked at each other and sighed. For the first time in several hours, there were absolutely NO FLIES bothering us. Whoo hoo! Life was good again. We ate our lunch and Vicki took her nap. I read my book for awhile, but waking up before dawn had taken its toll, and my eyes grew sleepy. I also took a short nap, a light snooze with the sound of flies and bees and nearby birds in the background. 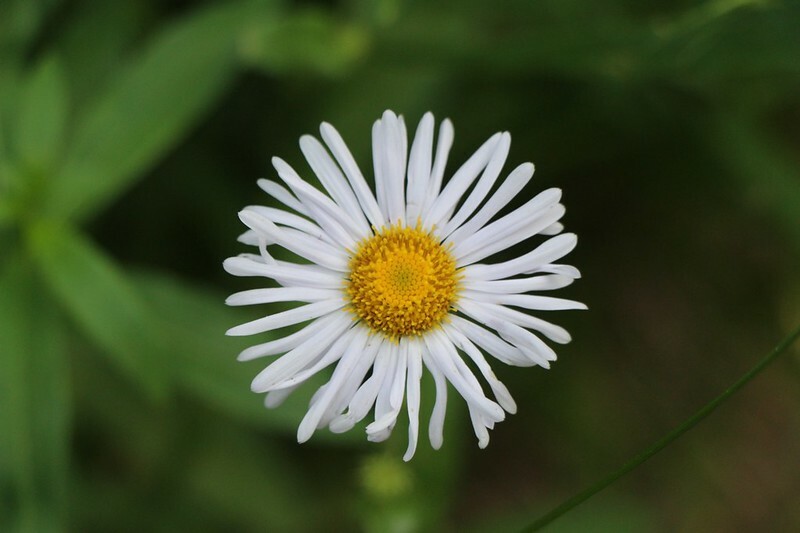 The smell of pines and flowers was in the air, and even in the shade it was warm, perfect for sleeping. We enjoyed the tent for close to an hour, but eventually we woke up. 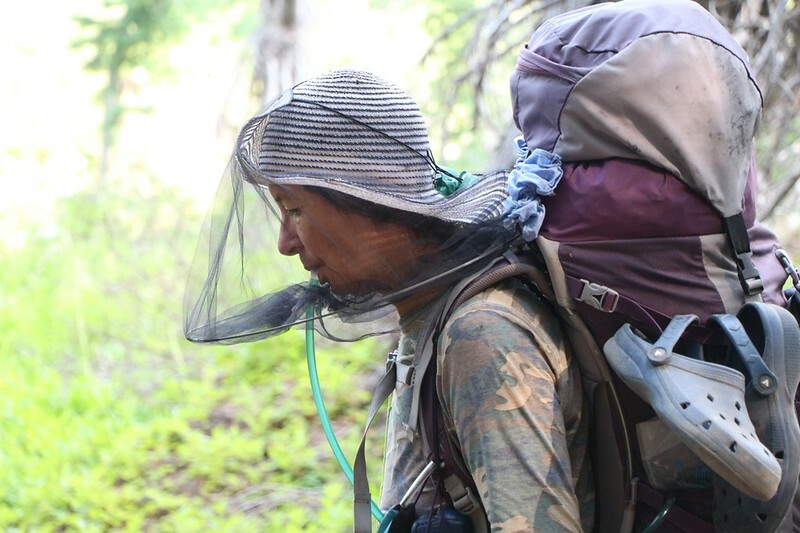 We knew that we really ought to keep hiking, and prepared to venture out once again into the Land of Interminable Flies. This time, Vicki absolutely refused to wear those long pants. 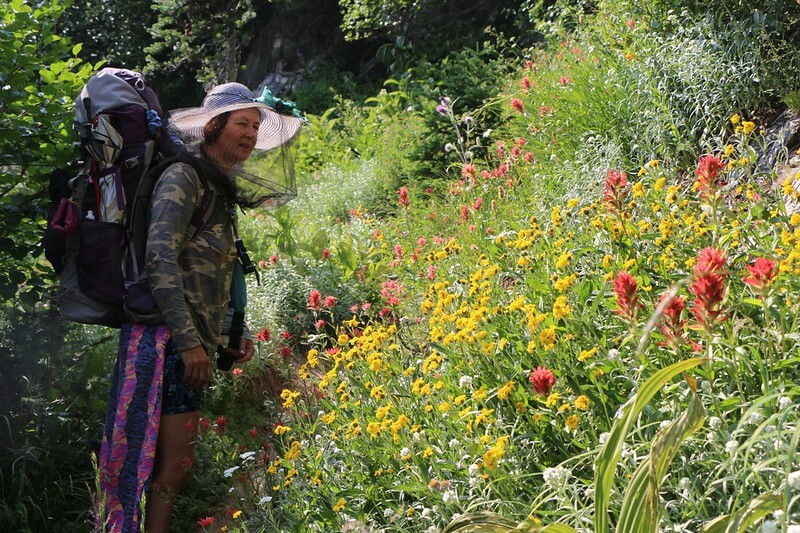 Her legs generated too much heat, hiking uphill in the sun, and desperately needed more air. But the flies would eat her alive. Her compromise solution was to not-quite-wear the pants, so that the weight of the backpack held them up at her waist but allowed the legs to dangle back behind her own legs. In that way, the pant legs acted much like a horse’s tail, swaying back and forth, endlessly batting the flies away as she walked. We also coated her legs in DEET bug repellent. They still landed on her, which was annoying, but they mostly flew off right away and only took a bite every so often. It would have to do. We re-packed the tent and hiked on. The trail climbed higher along the side of the valley and the views got better, although the air remained hazy. The trail curved deep into the valley near Pass No Pass (yes, that’s its name!) and crossed a creek where we met a troop of Boy Scouts heading down into the canyon. And that was when we realized that no one had passed our tent during lunch. Yes, it was a peaceful trail. And getting more beautiful all the time. Buck Creek Pass on the left and Helmet Butte, center. Our trail curves to the right then cuts left across the face of the butte. We were getting excited as we neared the pass. There were more high meadows and fewer trees up this high, and the flowers were blooming everywhere. Of course, that meant less shade, but it also allowed for a breeze. Not a bad trade, really. And the views were getting better and better. We were able to look back down the Buck Creek Valley as we traversed along the southern slopes of Helmet Butte. We stopped for a break and pointed out the trail and landmarks we’d passed earlier. Hiking onward, we sure were happy to see Buck Creek Pass come into view as we rounded the corner of the mountain. As we got closer to the pass, it became evident that the trail was climbing far higher than it needed to. In fact, it seemed to be avoiding the actual pass altogether! I had seen it on the topographic map earlier and had tried to warn Vicki beforehand, but it still managed to piss her off. She hates pointless uphill hiking. We could see an obvious campsite down below us, but this stupid trail wasn’t even heading toward it. In fact, it went right past it! True, there was a “cheater trail” that went directly to it but the rangers had marked it with signs saying “Closed for Restoration” and blocked it with a couple of easily-avoidable logs. We decided to be good trail citizens and take the longer, uphill, official path to Buck Creek Pass. The campsite itself turned out to be awesome. It was directly on the ridge of the pass and had views that couldn’t be beat: Buck Creek Valley to the east, Liberty Cap to the south, Helmet Butte to the north, and (most impressive of all) Glacier Peak towering huge and snow-covered and hazy across the Suiattle River Valley to the west. 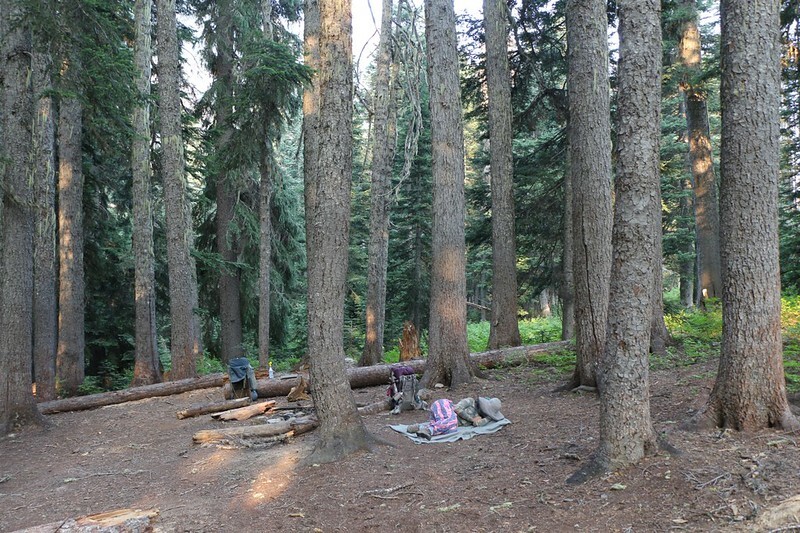 We set our packs down directly in the middle of the campsite, thereby claiming it for ourselves (according to the unwritten code of backpacking). But we weren’t absolutely sure that it was the best campsite at the pass. So we decided to reconnoiter the entire area, leaving the packs sitting there all alone, unpacked. 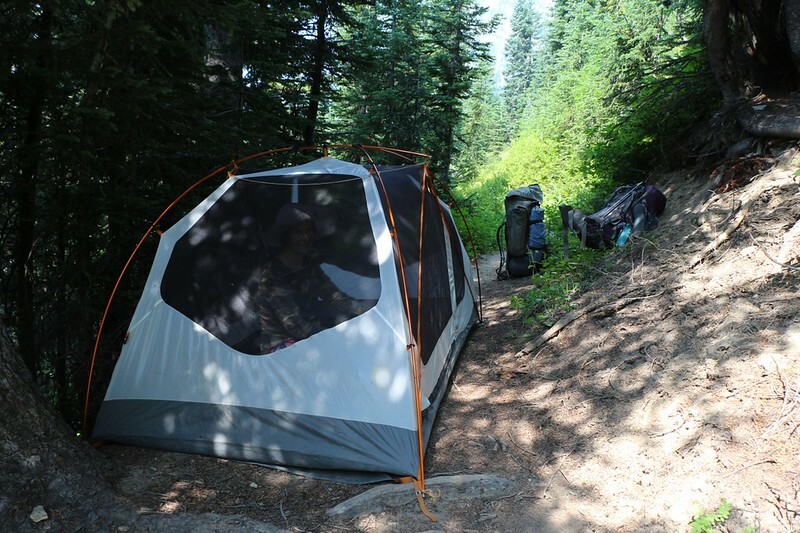 We headed downhill on the trail to the actual pass and scoped out a couple of nice established camping areas. 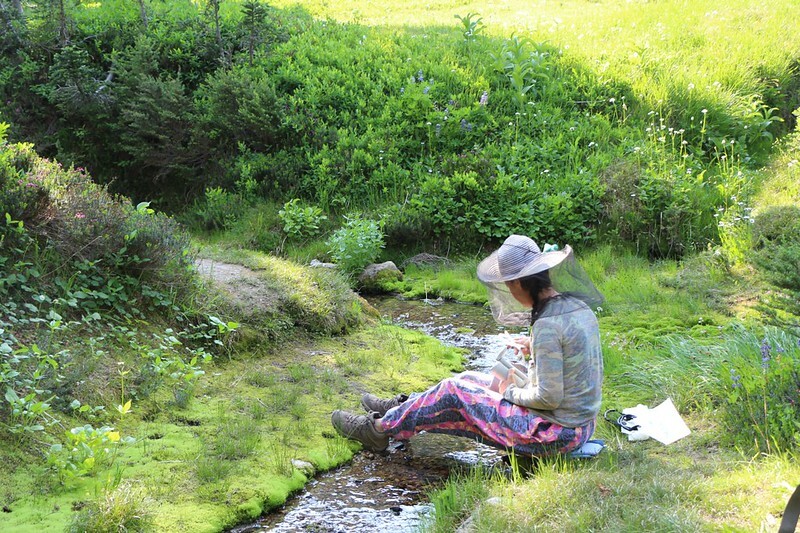 There was also a small stream flowing from a meadow on the Liberty Cap side of the pass. It was a relief to see water so close, rather than being forced to hike an extra mile or two back around Helmet Butte. There was another trail to the horse camp, but it was a quarter mile away and we didn’t bother going down there. As we hiked back up to our packs we decided that the spots down at the pass had more shade but fewer views, and what we truly came out here for was to enjoy the views. So the first spot won. We immediately set up the tent and got the camp in order, then headed back down once more to filter a bunch of water. We were planning on staying here for the next two nights, so we spent extra time getting everything set up just right. 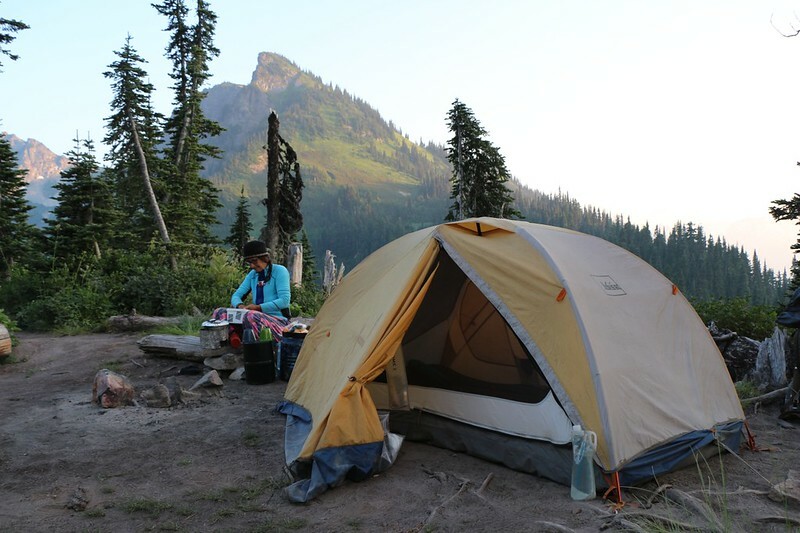 After a short nap in the tent, Vicki cooked up some hot water for tea and a freeze-dried dinner. There was a stone firepit that she had converted into a kitchen using a large flat rock, and it was perfect for the stove. We sat on a log nearby and read our books while we ate dinner. It was very peaceful. A couple of groups of hikers arrived and we pointed them down the hill to the other campsites and the stream. We knew that they were jealous of our awesome location, but we didn’t hold it against them. We just smiled and took in the views all around us. We hung out and enjoyed the sunset over Glacier Peak, but we didn’t stay up much longer. It had been a long hot day with a lot of climbing. We also went to bed knowing that there was absolutely no rush to wake up the next morning, unlike the pre-dawn start we’d had earlier. Tomorrow was going to be a “layover day” for us. In other words, we’d be taking a vacation from our vacation, and there was even less pressure to get things done than ever. And after the last two days of hiking, we deserved it.